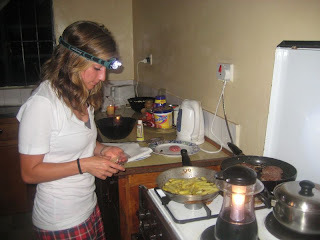 Sunday: Power-outage means Daina was able to cook hamburgers and french fries with a head-lamp on. 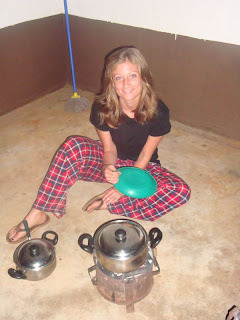 Monday: The gas ran out, so Daina got to cook chicken, rice and corn on a small charcoal stove (called a jiko) on the back porch. (I made chocolate-chip brownies from a box--they were under-cooked, but tasty nonetheless.) 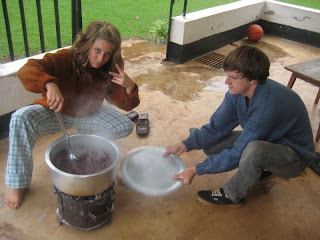 Tuesday: Same jiko, different food. Tonight she's making rice and black beans (which have to cook for 5 hours)...oh, and she's cooking in her new sweater Seriously, I think we would all appreciate a microwave right now...but, it's been really, really tasty food...so that's good.